The photo was taken on 10/25/17 at 9:28 AM. The location was in the kitchen of my home in Bethesda, MD. The "Take It!" 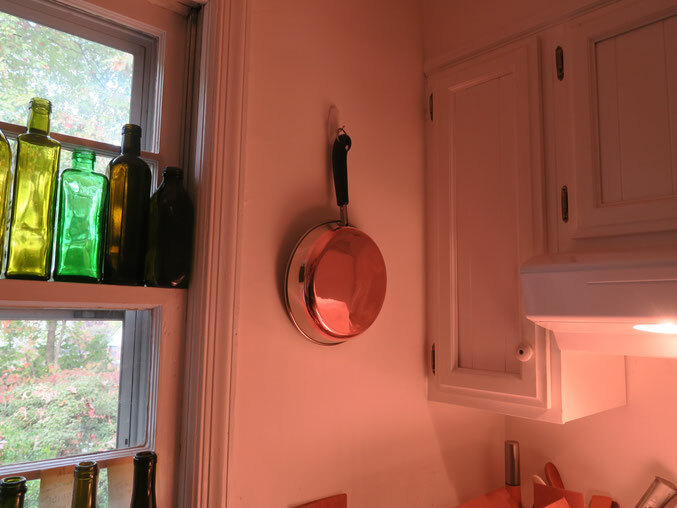 came after having hung this newly polished copper bottomed frying pan on the wall of my kitchen to add a little atmospheric warmth to a cold corner, I had bought the rough pan some months ago after finding it in a thrift store. It had reminded me of a whole set of pots and pans by "Revere Ware" which my Mother was thrilled to have gotten as a gift from my Dad. She used them for the rest of her life. I had the priviledge of cleaning these utensils as a part of "doing the dishes" previous to our getting a dishwashing machine. I purchased the used pan and took it to the plating shop I frequent and had them straighten and polish the piece. I was pleasantly surprised at how good a job they did. It took a while to decide what to do with the pan once It was finished. This corner location happened to jump out at me as being perfect. While the pan cannot serve as a mirror due to the imperfections in the surface of the metal, One can get some blurred images reflected in the copper. The After Take: calls for me to note that when taking the photo of the pan I purposely included some of the kitchen window to show a little bit of the green bottles I had placed in the upper window frame. This shot includes some of the bottles located on the sill of the same window. While it is not a piece of formal art - this helps add meaningful atmosphere to the kitchen. Here is hoping fall is starting out mild for you as it is for us. Wow that looks new. Surprising you found it in a thrift shop. My mom has some old copper bottom pans and pots. Looking at this I really need to get her to polish them. That is beautiful. I'm sitting here wondering what the bottles would look like reflected off that pan. They don't make 'em like that anymore. Too bad, I used to own a few and they were great. I actually tossed them because over about 30 years they became pretty gross. I might've held onto 'em if I had known they clean up like that! We recently did this with some of our old pans, really makes a huge difference. mine look pretty much the exact opposite of that im pretty sure it started out silver its completely black and brown now.